One hundred fifty bright orange solar powered Spin bicycles arrived on campus April 5 in front of Miller Hall. As part of a new bike sharing program at La Verne, the wheels are available to students for 50 cents every half hour or $14 per month with unlimited use. Spin, founded in San Francisco in 2016, offers an affordable and environmentally-friendly form of personal mobility. Each bike is equipped with solar powered lights and foam wheels to mitigate maintenance issues. Lisa Grater, transportation services manager, introduced this program to La Verne and said she wants everyone on campus to take ownership of the program to encourage its success. Once the Spin app is downloaded, anyone can unlock a Spin bike by scanning the QR code on the bike. Students are encouraged to park the self-locking bikes back on campus at night, but can leave them around the city of La Verne. “The bikes are housed on the University property,” Grater said. Technicians from the American Bike Patrol Services, who services La Verne’s security and rental bikes, will locate any bikes in need of maintenance or left in the city and return them to campus. Andrew Tucker, technician for American Bike Patrol Services, explained the concept of the Spin bikes to curious students and faculty. 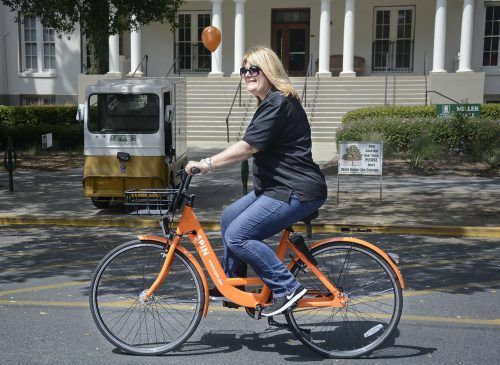 “The bikes are free today since we are in the process of dispersing,” Tucker said. Tucker said the bikes are a more affordable and low maintenance option for students. Tucker encourages students to wear a helmet and pay attention while riding. Grater has looked at other alternative transportation options for La Verne like the bike library and free passes for the Foothill Transit Bus. Al Clark, professor of humanities, has used his bike to get to and from campus for 21 years. He has an eight mile commute each way and is hopeful students will see the benefits that biking produces. Clark will not personally use the Spin bikeshare program since he has his own set of wheels, but encourages students to take advantage of the program. Jay Jones, professor of biology and biochemistry, said people understand there is an environmental problem, but they do not internalize it.